Television Critics Association Press Tour, Pasadena, CA, January 21, 2014 – Today PBS KIDS announced the production of its newest series: ODD SQUAD, a live-action media property designed to help kids ages 5-8 learn math. 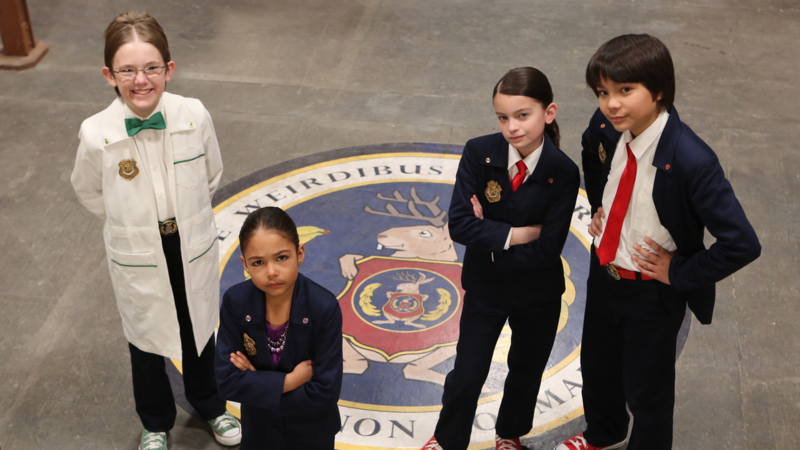 The show focuses on two young agents, Olive and Otto, who are part of the Odd Squad, an agency whose mission is to save the day whenever something unusual happens in their town. A math concept is embedded in each of their cases, as Olive and Otto work together to problem-solve and correct the oddity du jour in each episode. Coming soon to PBS KIDS on-air, online and on mobile, ODD SQUAD is created by Tim McKeon (Foster's Home for Imaginary Friends, Adventure Time, The Electric Company) and Adam Peltzman (The Electric Company, The Backyardigans, Wallykazam!) and produced by Sinking Ship Entertainment and The Fred Rogers Company. ODD SQUAD is funded in part by the U.S. Department of Education through the Ready To Learn Initiative, a program that supports the development of innovative educational television and digital media targeted to preschool and early elementary school children and their families, and by the Corporation for Public Broadcasting (CPB). ODD SQUAD is part of PBS KIDS’ ongoing commitment to use the power of media to help open up worlds of possibilities for children. PBS KIDS serves young audiences wherever they live, learn and play — through educational apps, on TV, online and in the classroom. PBS KIDS, the number-one educational media brand for kids, offers all children the opportunity to explore new ideas and new worlds through television, online, mobile and community-based programs. Kidscreen- and Webby-award winning pbskids.org provides engaging interactive content, including the PBS KIDS video player, now offering free streaming video accessible on computer- and mobile-device-based browsers. For more information on specific PBS KIDS content supporting literacy, science, math and more, visit pbs.org/pressroom or follow PBS KIDS on Twitter and Facebook. Sinking Ship Entertainment is an award-winning production and interactive company that creates and produces groundbreaking kids TV and transmedia content. Since its founding in 2004, Sinking Ship has created and produced numerous children’s TV series and has been on the forefront of TV production and interactive media for kids. From being selected as one of the first partners of Amazon Studios with the upcoming series Annedroids, to achieving Nick Jr.’s highest debut of all time with the action-packed series Dino Dan, Sinking Ship Entertainment brings dynamic content to audiences around the world with shows broadcast in more than 130 countries. Other series highlights include the award-winning “This is Daniel Cook,” “This is Emily Yeung” and “Are We There Yet? : World Adventure.” Find out more at www.sinkingship.ca.